Just over a week to go, get those proposals in for Heaven and Earth VI! I have been updating galleries on facebook like crazy to showcase the many beautiful spaces that would take your art work. There are even some videos of the locations. Now it's your job to propose something. Carkeek is one of the most beautiful parks in Seattle. It meanders across many levels and offers an array of spaces unique in vantage points and horticultural style. In 2009 we were new to the area, and happened to walk into the Edward McAbee Entrance. This was the first Heaven and Earth and I fell in love. Plant adoptions were occurring and we adopted an oxalis which has since taken over much of our tiny garden, what was a weedy little plant is now a mass running three foot by four foot, ever a reminder of that first Heaven and Earth. I have thoroughly enjoyed participating in Heaven and Earth as an artist, what could be better then art in a slice of nature amidst the mass of the city. Nature and art meet , white walls stay out we don't need you. Visit CoCA to submit Now! Artists and citizens of the Earth! For 6 years Carkeek Park Advisory Council has helped to fund Heaven and Earth the Exhibition. Here is an opportunity to give back and meet up with folks who tend and care for the park! Also a great chance for artists to come check out locations and meet folks who might be able to assist in natural supplies for making all that art you're about to propose! Stop by say hi , ask questions, volunteer! In collaboration with Seattle Parks and Recreation and the Carkeek Park Advisory Council, the Center on Contemporary Art (CoCA) will orchestrate an exhibition of temporary artwork in the urban forest of Carkeek Park for the sixth consecutive year, from July 12, 2014 - October 19, 2014 CoCA will accept proposals for a wide variety of media for placement in a series of suggested locations viewable online (http://www.cocaseattle.org/carkeekphotos.htm). As Above so Below is open to all artists (whether established or emerging), local, regional, national, or international. All work should have a minimal impact on the park and eventually leave “no trace” following removal. Working in conjunction with its partners, CoCA will select up to 12 artists and/or artist’s teams from the pool of applicants and offer an honorarium of $500. CoCA will also publish a map and full color catalog of the exhibition, create a shared blog, archive the work on www.heavenandearthexhibition.org, and offer participating artists a one-year membership in CoCA. The 2014 exhibition will be guest-juried by Thendara Kida-Gee, Artist/Curator, and Paula Hoff, Strategic Advisor, Seattle Parks and Recreation Superintendent’s Office. There is no fee to apply. As Above So Below: Heaven & Earth 6 is one of the region’s only venues for site-specific artwork in an urban forest setting where part of the exhibit includes a walking tour of an hour or more. Spread throughout Carkeek Park’s 200-plus acres of urban forest in a series of clusters linked by trails, As Above So Below affords a prime opportunity to explore a broad range of contemporary interpretations of art and nature, including performance, new media, landscape interventions, installations, sound art, biomimicry, ephemeral work, and other interdisciplinary perspectives. The title of this year’s show invites artist to explore the connections and relationships that exist within all of nature, physical, mental and spiritual. Art will be placed around a core set of six parking areas within the park setting, making the whole exhibition more easily accessible for all levels of mobility. This encourages public stewardship and a sense that the works are not in isolation to one another but part of larger whole. Carkeek Park visitorship during the display period is estimated at 100,000. In addition, hiking groups from Mountaineers, Seattle Plein-Air Painters, and other organizations actively offer programming that centers on the art-hike. Generous funding for the exhibition is provided by Carkeek Park Advisory Council and Seattle Office of Arts & Cultural Affairs, as well as vital in kind support from Seattle Parks and Recreation, and Associated Recreation Council. July 11, 2014. Opening reception will take place on Saturday July 12, 2014 at Carkeek’s Environmental Learning Center, 950 NW Carkeek Park Rd, Seattle, 91877, 2-5pm. Please send submissions to http://www.cocaseattle.org/submission.php. 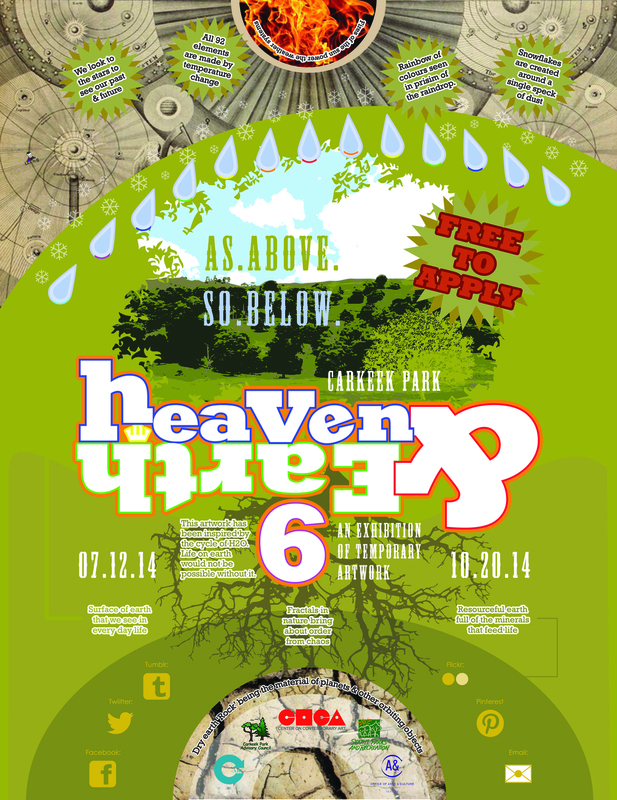 Be sure to select “Heaven and Earth 6” when prompted for what exhibit you are submitting for. Please call 206.851.2524 or contact Thendara@cocaseattle.org (Thendara Kida-Gee, Curator) for more information. CoCA will ask participating artists to sign a W-9 to receive the honorarium, and a liability waiver (“Artist’s Loan Agreement”) recognizing the inherent risk of exhibiting unsecured art in a public setting and seeking permission to use any images for promotional purposes. 4Culture also offer grant opportunities through their individual Artist Projects grant, with a deadline of March 5.